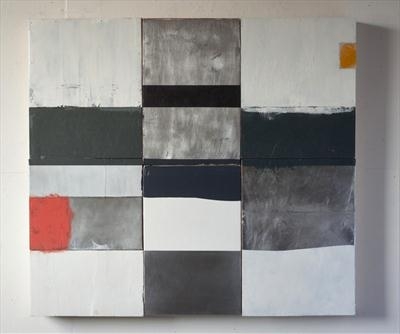 In the construction of his paintings, Robert Manners applies the modular dimensions of his practice in a rigorous exploration of texture and form. This process of constant experimentation is charged with the dynamic of assemblage and the chance of found materials - the relationship not only between varying material and colour, but the surprise of combinations as a two dimensional painting is constructed from materials on three planes. Exploring the influence of engineering and his fascination with marine debris, Manners draws on a series of influences ranging from Ben Nicholson to Louise Nevelson, to create paintings which resonate with insight and quiet authority. This series of work is assembled from any number of differently constructed panels each of which have been built and sometimes painted. My approach has emerged from interests and relationships with the material, its surface and the three dimensional qualities of ships, navigational buoys and other paraphernalia from boatyards and dockyards. While conceived as paintings, the works seem to exist in the periphery between painting and sculpture. The term refit, used in its literal meaning, is the work of repairing and overhauling boats and ships. In the context of these paintings, the refit is the modular system of differently constructed panels, made from different materials, which are interchangeable during the making process. The paintings are made by this process of continual construction, layering and erosion, change and interchange. The ‘seascape refit’ is quite literally the refitting or re-organisation of the tradition of British seascape painting, part of a tradition that can be traced back to Turner, Nicholson and Scott. Recently, I have been developing a method to render these ideas through my printmaking. 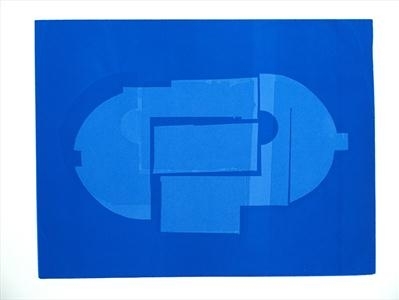 SSR P3, which is a Blind Embossed print, is currently on show at Bankside Galleries, London as part of RE OPEN. A series of 12 paintings for the Cancer Treatment Clinic in central Bristol.